At the Annual UKIP Conference held this year in the city of Birmingham Nigel Farage reiterated that to gain success, the party should exclude extremists and better focus on organising and preparing for elections. "With a heavy heart, I am leaving Ukip," the former UKIP leader and currently Vice Chairman of LeveMeansLeave campaign noted, adding "it is not the Brexit party our nation so badly needs," as cited by The Telegraph. "There is a huge space for a Brexit party in British politics, but it won't be filled by Ukip," the politician stated. In late November, Farage, an enthusiastic pro-leave campaigner, remarked that Britain's withdrawal arrangements added up to the "worst deal in history" for the UK. The UK Parliament is poised to discuss and vote on the Brexit withdrawal agreement soiled by Theresa May and the EU27 in an array of meetings all the way to December 12. 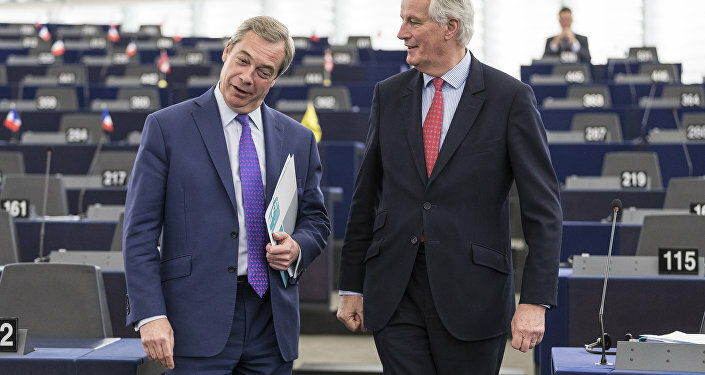 Addressing the EU Parliament and Michel Barnier, a French politician serving as European Chief Negotiator for the United Kingdom Exiting the EU, Farage suggested that the deal is not going to be accepted at home by UK lawmakers, since "there is a strong chance now of the UK leaving on March 29 on a WTO no-deal." "We need a negotiated deal to deal with sensible border issues," he made a point. According to Farage's campaign page on Twitter, "no deal is better than a bad deal." The bio features calls for the general public to sign up for the page to "help us ensure we make a swift, clean exit from the EU." Separately, Farage stated earlier that one of the reasons for UKIP's success was that "we'd excluded extremists and focussed on organising and fighting elections." "I warned that any change to this policy would damage the party beyond repair," he summed up while speaking at one of the party conferences in Birmingham earlier this year.